All living organisms are composed of cells, and all cells arise from other cells. These simple and powerful statements form the basis of the cell theory, first formulated by a group of European biologists in the mid-1800s. So fundamental are these ideas to biology that it is easy to forget they were not always thought to be true. 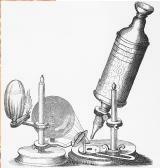 Robert Hooke's microscope. Hooke first described cells in 1665. The invention of the microscope allowed the first view of cells. English physicist and microscopist Robert Hooke (1635–1702) first described cells in 1665. He made thin slices of cork and likened the boxy partitions he observed to the cells (small rooms) in a monastery. The open spaces Hooke observed were empty, but he and others suggested these spaces might be used for fluid transport in living plants. He did not propose, and gave no indication that he believed, that these structures represented the basic unit of living organisms. Marcello Malpighi (1628–1694), and Hooke's colleague, Nehemiah Grew (1641–1712), made detailed studies of plant cells and established the presence of cellular structures throughout the plant body. Grew likened the cellular spaces to the gas bubbles in rising bread and suggested they may have formed through a similar process. The presence of cells in animal tissue was demonstrated later than in plants because the thin sections needed for viewing under the microscope are more difficult to prepare for animal tissues. The prevalent view of Hooke's contemporaries was that animals were composed of several types of fibers, the various properties of which accounted for the differences among tissues. At the time, virtually all biologists were convinced that organisms were composed of some type of fundamental unit, and it was these "atomistic" preconceptions that drove them to look for such units. While improvements in microscopy made their observations better, it was the underlying belief that there was some fundamental substructure that made the microscope the instrument of choice in the study of life. In 1676 the Dutch microscopist Antony van Leeuwenhoek (1632–1723) published his observations of single-cell organisms, or "little animalcules" as he called them. It is likely that Leeuwenhoek was the first person to observe a red blood cell and a sperm cell. Leeuwenhoek made numerous and detailed observations on his microorganisms, but more than one hundred years passed before a connection was made between the obviously cellular structure of these creatures and the existence of cells in animals or plants. In 1824 Frenchman Henri Milne-Edwards suggested that the basic structure of all animal tissues was an array of "globules," though his insistence on uniform size for these globules puts into question the accuracy of his observations. Henri Dutrochet (1776–1847) made the connection between plant cells and animal cells explicit, and he proposed that the cell was not just a structural but also a physiological unit: "It is clear that it constitutes the basic unit of the organized state; indeed, everything is ultimately derived from the cell" (Harris 1999, p. 29). Dutrochet proposed that new cells arise from within old ones, a view that was echoed by his contemporary François Raspail (1794–1878). Raspail was the first to state one of the two major tenets of cell theory: Omnis cellula e cellula, which means "Every cell is derived from another cell." However, despite this ringing and famous phrase, his proposed mechanism of cell generation was incorrect. Raspail was also the founder of cell biochemistry, making experiments on the chemical composition of the cell and their response to changing chemical environments. In 1832 Barthelemy Dumortier (1797–1878) of France described "binary fission" (cell division) in plants. He observed the formation of a mid-line partition between the original cell and the new cell, which, Dumortier noted, "seems to us to provide a perfectly clear explanation of the origin and development of cells, which has hitherto remained unexplained" (Harris 1999, p. 66) These observations led him to reject the idea that new cells arise from within old ones, or that they form spontaneously from noncellular material. The discovery of cell division is usually attributed to Hugo von Mohl (1805–1872), but Dumortier proceeded him in this regard. Von Mohl did coin the word "protoplasm" for the material contained in the cell. The first unequivocal description of the cell nucleus was made by a Czech, Franz Bauer, in 1802 and was given its name in 1831 by Robert Brown (1773–1858) of Scotland, who is best remembered for discovering the random "Brownian" motion of molecules. The first accurate description of the nucleolus was made in 1835. In 1839 a fellow German, Theodor Schwann (1810–1882), proposed that in animals too every structural element is composed of cells or cell products. Schwann's contribution might be regarded as the more groundbreaking, since the understanding of animal structure lagged behind that of plants. In addition, Schwann made the explicit claim that the fundamental laws governing cells were identical between plants and animals: "A common principle underlies the development of all the individual elementary subunits of all organisms" (Harris 1999, p. 102). A special word should be said here about the Czech Jan Purkyňe (1787–1869), or Purkinje, as his name is usually given. Purkinje was the premiere cytologist of his day, and one of the most influential formulators of the cell theory. He gave his name to structures throughout the body, including the Purkinje cells of the cerebellum. Purkinje, in fact, deserves much of the credit that usually goes to Schwann, for in 1837 he proposed not only that animals were composed principally of cells and cell products (though he left room for fibers) but also that the "basic cellular tissue is again clearly analogous to that of plants" (Harris 1999, p. 92). Unfortunately, Schwann did not credit Purkinje in his influential publication. Despite the work of Dumortier, the origins of new cells remained controversial and confused. In 1852 a German, Robert Remak (1852–1865), published his observations on cell division, stating categorically that the generation schemes proposed by Schleiden and Schwann were wrong. Based on his observations of embryos, Remak stated instead that binary fission was the means of reproduction of new animal cells. This view was widely publicized not by Remak but by Rudolf Virchow (1821–1902), unfortunately without crediting Remak. Virchow is also usually given the credit for the phrase Omnis cellula e cellula, indicating the importance of cell division in the creation of new cells. The understanding of the central importance of chromosomes lagged well behind their discovery. In 1879 Walther Flemming (1843–1905) noted that the chromosomes split longitudinally during mitosis (a term he introduced). Wilhelm Roux (1850–1924) proposed that each chromosome carried a different set of hereditable elements and suggested that the longitudinal splitting observed by Flemming ensured the equal division of these elements. This scheme was confirmed in 1904 by Theodor Boveri (1862–1915). Combined with the rediscovery of Gregor Mendel's 1866 paper on heritable elements in peas, these results highlighted the central role of the chromosomes in carrying genetic material. The chemical nature of the gene was determined in a series of experiments over the next fifty years, culminating in the determination of the structure of deoxyribonucleic acid (DNA) in 1953 by James Watson and Francis Crick. The modern understanding of cellular substructure began with the use of the electron microscope. Keith Porter (1912–1997) was a pioneer in this field and was the first to identify the endoplasmic reticulum and many elements of the cytoskeleton . The explosion of knowledge brought about by improvements in microscopy, biochemistry, and genetics has led to a depth of understanding of cell structure and function undreamed of by the earliest cell biologists. Harris, Henry. The Birth of the Cell. New Haven, CT: Yale University Press, 1999. Magner, Lois N. History of Life Sciences, 2nd ed. New York: Marcel Dekker, 1994. Premier cell biologist of the early twentieth century, Wilson described how a fertilized egg divides up into hundreds of cells to form an embryo and which parts of the body develop from which cells. His student Walter Sutton discovered the role of chromosomes as the units of heredity. The whole theory is understandable but a bit complicated but I would like to know more about the parts that might be dicovered lately and what about the people that already studied the whole of a cell. WHAT IS THE RELEVANCE OF THESE MICROSCOPES TO LIFE TODAY? Microscopes today reveal a world within a cell. This world has libraries of information. Your question as well as all mankind is, "what is the source which compiled this information"? Where and how did the origination of the information come into existence? Information is what makes the microscopes revelations relevant to the question which needs to be ultimately answered. What is the source of the cells information? What is the cause of something so complex that it takes generations of scientist and extremely sophisticated technology designed by brilliant minds to discover and uncover. A good scientific description of how information is added to organisms through natural selection can be found in Richard Dawkins' book "Climbing Mount Improbable." Basically, information is added to organisms' genes over generations when organisms with helpful genetic variations survive in greater numbers than organism that lack the useful variations. Over time, the genes record information what increases the survival rates of the species. Very interesting information every body should see this information.